SM West strolled out of North District Stadium on Friday night with a hard earned 28-0 shutout victory over the SM North Indians. Several turnovers hurt the Vikings throughout the game, but a tough defensive effort kept SM North off the scoreboard and kept the Vikings in a comfortable state during the game. Darron Harvey (left) scored the first touchdown of the game on a four yard run in the first quarter. Up 7-0, SM West scored again early in the second quarter, this time on a nine yard Harvey run. SM West lead 14-0. SM North regained posession, but fumbled the ball on their own 31 yard line. SM West capitalized on the turnover as DJ Balazs hit Adam Leblanc on a 17 yard passing strike to help SM West increase their lead to 21-0. In the third quarter Balazs once again connected with Leblanc on a passing touchdown, this time on a 52 yard pass. The score put SM West up 28-0, a score that would hold until the game was finalized. For the day, Harvey finished with 25 carries for 152 yards and two touchdowns. Balazs went eight of 13 passing, for 110 yards, two touchdowns and one interception. - By beating SM North, SM West clinched a playoff spot and sets themselves up nicely for a potential 6A District-1 Championship if they win next week against SM East. - SM North was officially eliminated from making the playoffs given their loss and the SM Northwest win. - SM West's shutout of SM North was the first of the season, and the first one since shutting out SM East on September 7, 2007 of last season. - Harvey's 152 rushing yards pushed his season total to 1,481 yards. Harvey is third in the state in rushing yards behind Wichita East senior running back, and Miami (FL) commit Bryce Brown (1,743 yards), and Olathe North junior running back James Franklin (1,550 yards). - By gaining 19 more rushing yards Harvey will be able to join the exlusive 1,500 yard club at SM West. The tradition that was was put in place by head coach Tim Callaghan in 2003 has only one SM West member, former running back DJ Barnett, who as a senior in 2004 eclipsed that mark and rushed for over 1,900 yards. 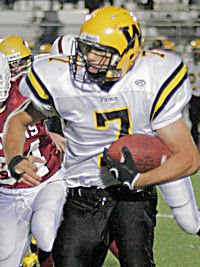 - SM West junior quarterback DJ Balazs has passed for 898 yards and nine touchdowns on the season. His career record as a starter is 12-4 (.750). SM West plays host to SM East (3-5, 0-2) next week at South District Stadium. With a victory West can complete its second undefeated regular season under Tim Callaghan. The game however is traditionally the biggest rivalry game for both teams. The Nut Cup is an trophy annually awarded to the winner of the game. SM West has held the trophy for well over a decade now.